The view of the H-diamond MOSFET NOR logic circuit from above (left), and the operation of the NOR logic circuits, showing that the circuit only produces voltage when both inputs are at zero. Credit: Liu et al. When power generators like windmills and solar panels transfer electricity to homes, businesses and the power grid, they lose almost 10 percent of the generated power. To address this problem, scientists are researching new diamond semiconductor circuits to make power conversion systems more efficient. A team of researchers from Japan successfully fabricated a key circuit in power conversion systems using hydrogenated diamond (H-diamond.) Furthermore, they demonstrated that it functions at temperatures as high as 300 degrees Celsius. These circuits can be used in diamond-based electronic devices that are smaller, lighter and more efficient than silicon-based devices. The researchers report their findings this week in Applied Physics Letters. Silicon's material properties make it a poor choice for circuits in high-power, high-temperature and high-frequency electronic devices. "For the high-power generators, diamond is more suitable for fabricating power conversion systems with a small size and low power loss," said Jiangwei Liu, a researcher at Japan's National Institute for Materials Science and a co-author on the paper. In the current study, researchers tested an H-diamond NOR logic circuit's stability at high temperatures. This type of circuit, used in computers, gives an output only when both inputs are zero. The circuit consisted of two metal-oxide-semiconductor field-effect transistors (MOSFETs), which are used in many electronic devices, and in digital integrated circuits, like microprocessors. In 2013, Liu and his colleagues were the first to report fabricating an E-mode H-diamond MOSFET. When the researchers heated the circuit to 300 degrees Celsius, it functioned correctly, but failed at 400 degrees. They suspect that the higher temperature caused the MOSFETs to breakdown. Higher temperatures may be achievable however, as another group reported successful operation of a similar H-diamond MOSFET at 400 degrees Celsius. For comparison, the maximum operation temperature for silicon-based electronic devices is about 150 degrees. 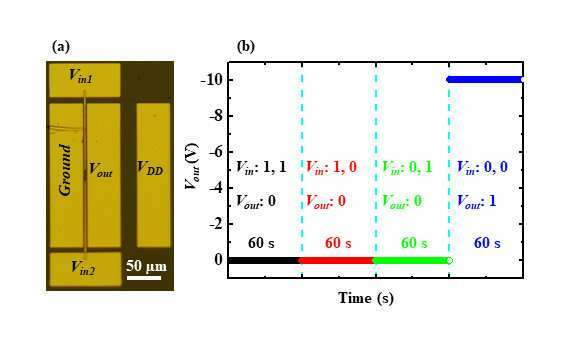 In the future, the researchers plan to improve the circuit's stability at high temperatures by altering the oxide insulators and modifying the fabrication process. They hope to construct H-diamond MOSFET logic circuits that can operate above 500 degrees Celsius and at 2.0 kilovolts. "Diamond is one of the candidate semiconductor materials for next-generation electronics, specifically for improving energy savings," said Yasuo Koide, a director at the National Institute for Materials Science and co-author on the paper. "Of course, in order to achieve industrialization, it is essential to develop inch-sized single-crystal diamond wafers and other diamond-based integrated circuits."